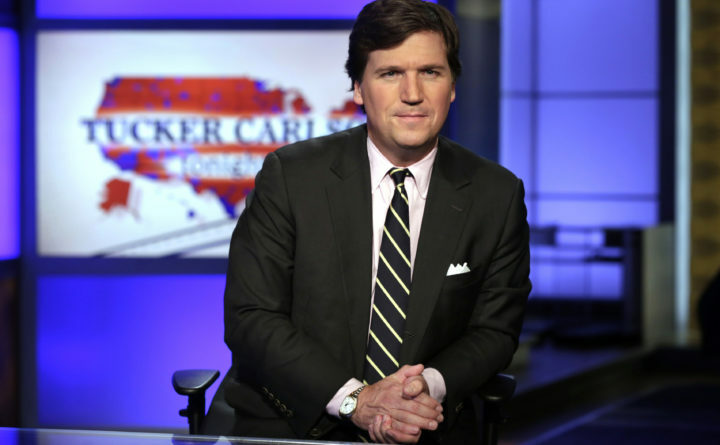 Tucker Carlson, host of "Tucker Carlson Tonight," poses for photos in a Fox News Channel studio in New York, March 2, 2017. Less than two weeks after Fox News host Tucker Carlson backed away from his plans to expand “the northernmost bureau of Fox News,” residents of a western Maine town voted to sell him a former town garage, even if he doesn’t want it anymore. The Bethel Citizen reports that Woodstock residents voted unanimously at their annual town meeting on Monday to sell the former town garage to the conservative commentator for $30,000. In a letter sent to the Oxford County town, Carlson had expressed interest in buying the old town garage next to Woodstock’s library and turning it into a studio with room enough for an audience, according to the Sun Journal, which first reported Carlson’s plans. Carlson, who vacations at Christopher Lake, also known as Bryant Pond, in town, has paid $2,500 per year to rent space in the basement of the town’s library from which he has broadcasted during the summer. But Carlson later backed away from those plans after they became public, saying that Fox News didn’t want to leave expensive broadcasting equipment in a rural studio whose presence has been widely publicized. Carlson has recently come under fire after recordings surfaced of him making misogynistic, racist and homophobic remarks on the shock-jock radio program “Bubba the Love Sponge Show.” Those recordings, dating from 2006 to 2011, were released earlier this month by Media Matters for America, a liberal watchdog group, according to the Washington Post. In response, some advertisers have begun to back away from Carlson’s show on Fox News. About 40 people attended the town meeting at Woodstock Elementary School, according to the Bethel Citizen. Residents re-elected Ron Deegan to another three-year term on the Board of Selectmen and approved an accident recovery fee ordinance that permits the town to collect a fee when firefighters are at a commercial vehicle crash for at least four hours, the Citizen reports. Woodstock, which includes the village of Bryant Pond, is a town of about 1,300, according to the 2010 U.S. Census. It is northwest of Lewiston and Auburn.